Sorry that it’s been a while since I’ve posted! But, do not worry, this post will sure make up for the time I’ve been absent! 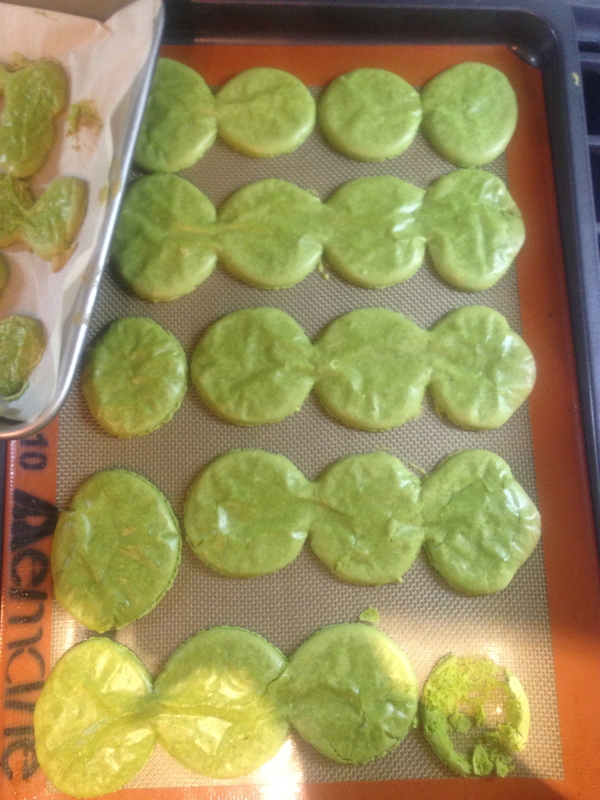 Recently, I had a few friends over to make the infamous MACARON. Previously, I tried making macarons, but they weren’t too successful because there were no feet (the ruffle on the edges of the macaron). 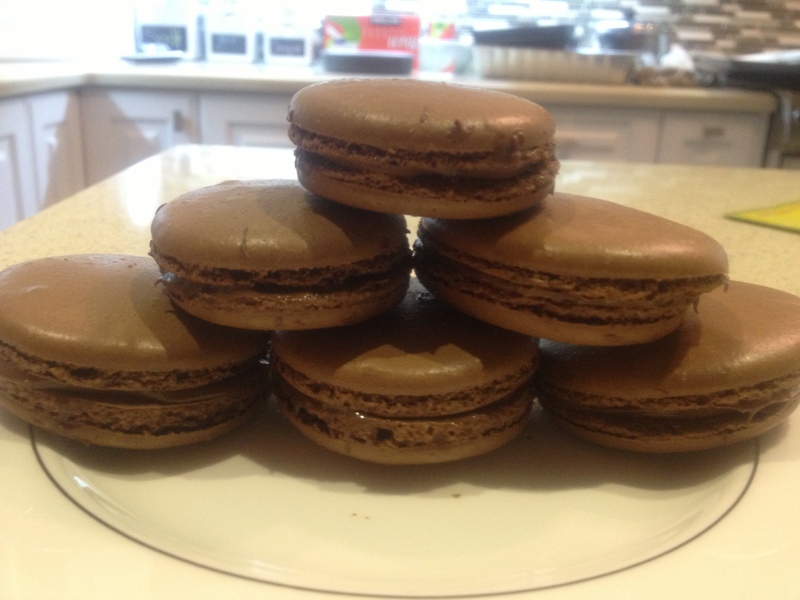 As well, the macaron shell were deflated due to an extremely runny batter– it was oozing out of the piping bag! The second time I made the macarons, I was a bit more successful. Small feet appeared on some, but many did not rise enough. Nevertheless, the third time’s the charm right?! This time, ALL the macarons had feet, and rose pretty well with minimal cracks. I was extremely happy with the result because I sure put tons of time and effort into making these french delicacies. I guess this goes to show that practice makes perfect. The recipe I used is here and involves using the Italian Meringue method, which essentially boils the sugar in the water until the soft ball stage (around 235 F) The product was extremely chocolaty, but hey, I’m not complaining! 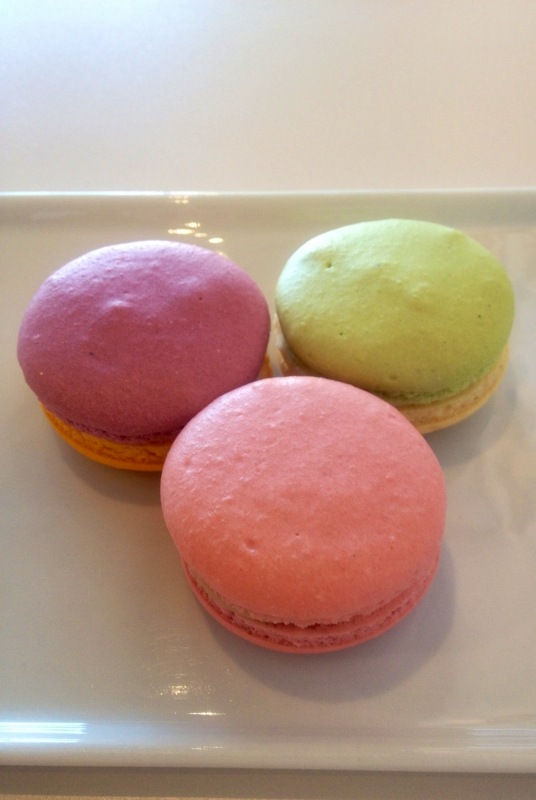 However, I do want to give a few pointers to those of you making macarons for your first time! 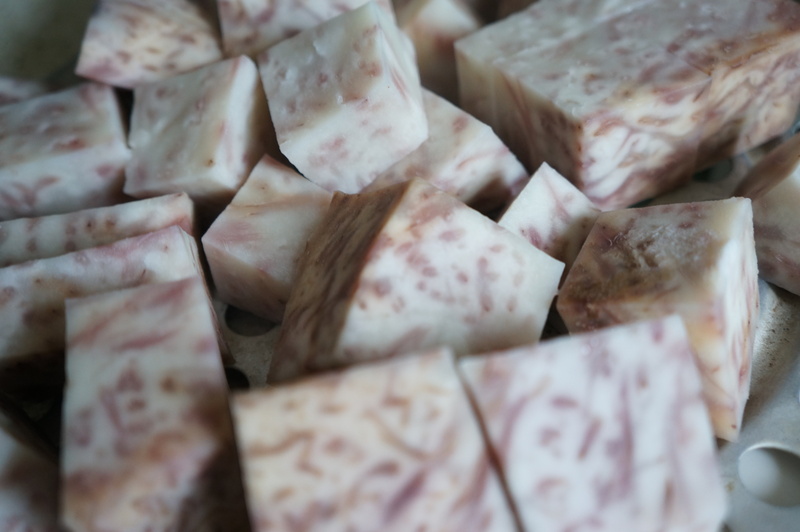 1) Look for youtube tutorials on how to make. Here is one that I recommend. 4) Let your egg whites age the night before (or even 2 nights before) to reduce the moisture content, allowing the macaron to have a more elastic texture. 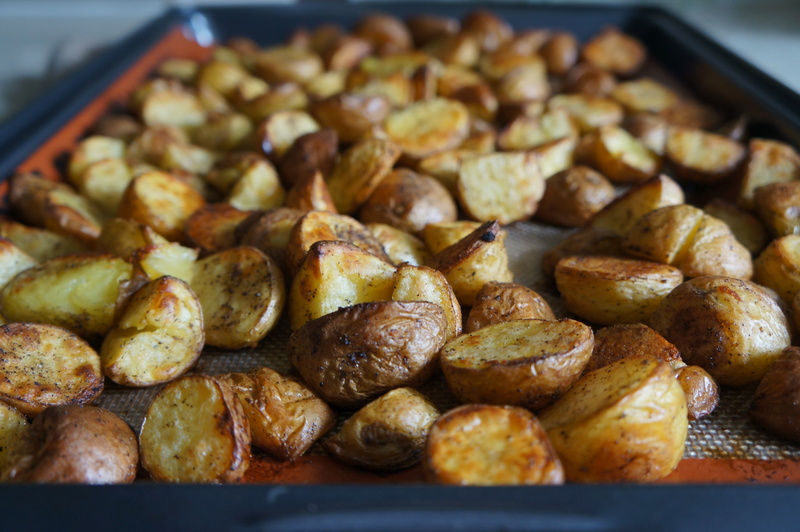 6) Gently fold your dry ingredients into the whites. 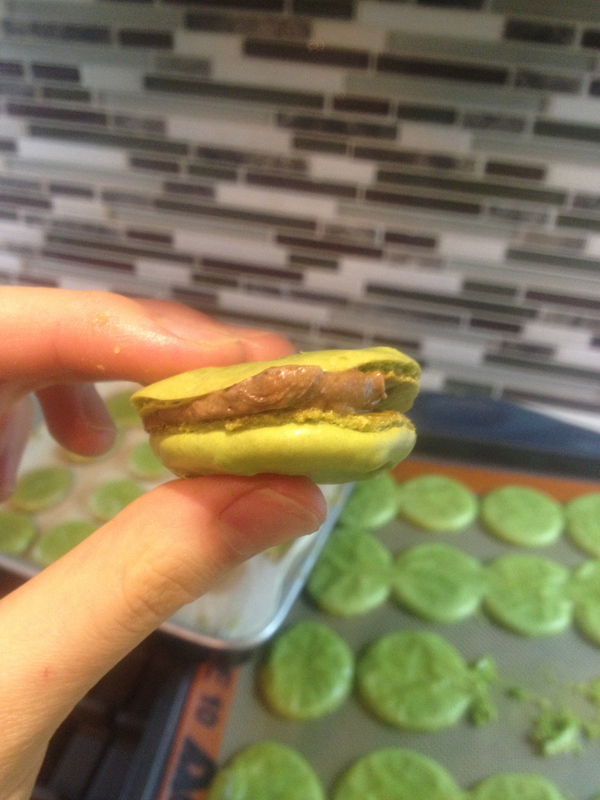 Be sure to not to over mix or else you will end up with a runny batter like the one I had with my matcha macarons. The batter should be thick and drip slowly from the spatula. Since my trip to Paris in 2011, I’ve fallen in love with macarons. I cant believe I didn’t try them earlier! In Paris the famous Maison Ladurée was where I had my first macaron. The light and airy crunchy shell along with the sweet and smooth buttercream was just heaven in my mouth. 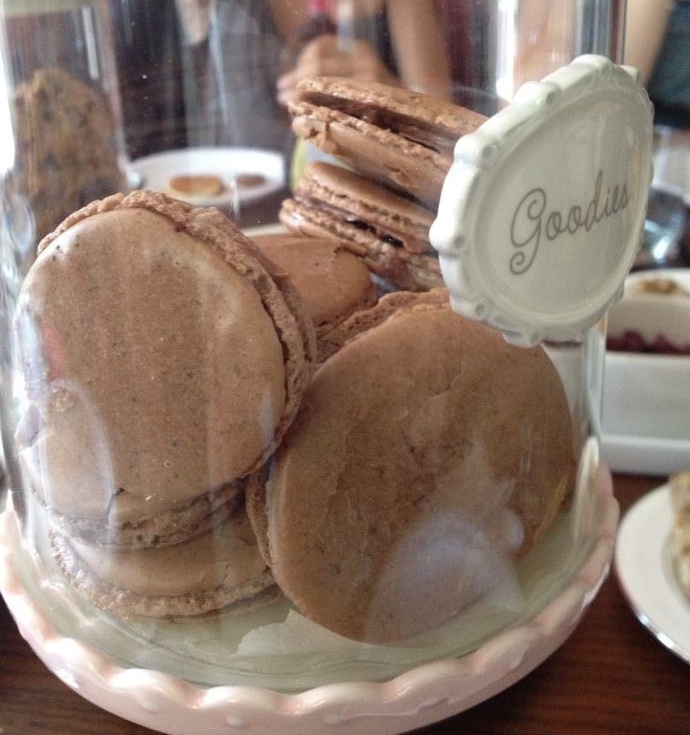 Now that I’m in Toronto, one of my missions is to find the perfect macaron– and I think I’ve done it! Ladies and Gentleman, I present to you, Butter Avenue. Even though they just opened last year, Butter Avenue isn’t far behind some of the other macaron stores in Toronto! The beautiful and chic white decor makes the store a great place to sit down with some friends and enjoy a nice cup of cappuccino and some sweet delicacies! Today, I got three flavours: Vie en Rose, Lime & Honey, and Blueberry Cheesecake. The Vie en Rose was great! Although I wish there was a greater rose taste to the macaron, I was extremely pleased with the texture of the macaroon. Crunchy exterior shell, but extremely light on the inside. 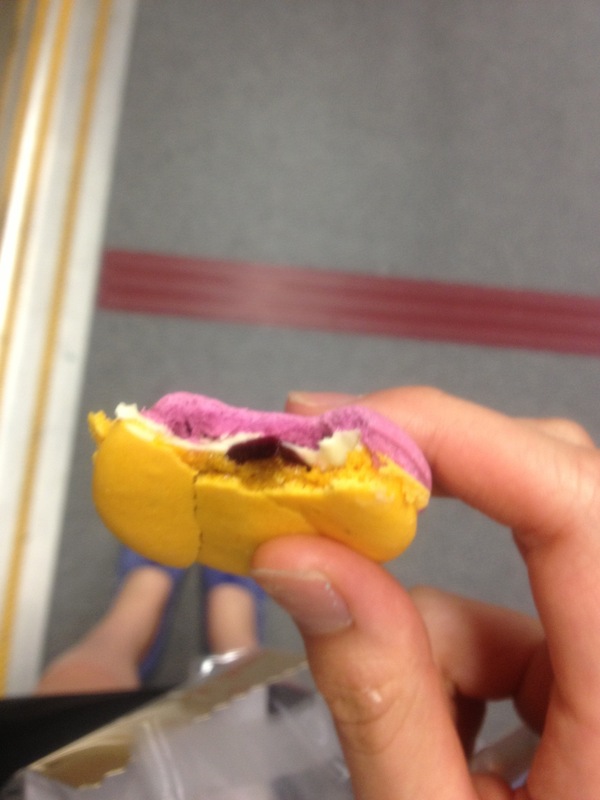 As well, I’ve had some macaroons in other stores and they were just too sweet! However, i don’t have to worry about that problem with the macarons at Butter Avenue! 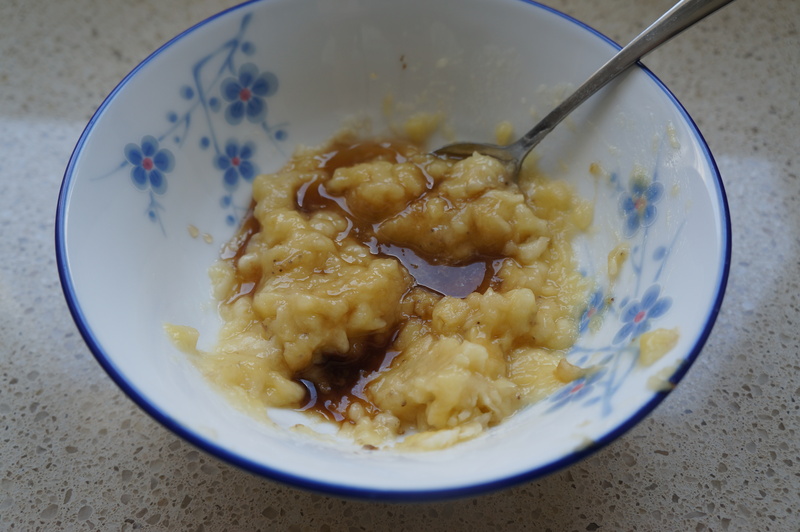 After , I tried the lime and honey. I could taste the tartness of the lime and the sweetness of the honey. Another great flavour. However, my favourite flavour would have to be the blueberry cheesecake. I was very surprised that I even liked it because I’m not a fan of cheesecake. However sandwiched between the sweet macaroon shell was a creamy “cheesecake” buttercream. If that isn’t enough cheesecake goodness for you, there was also a blueberry gelee in the middle of the macaron! For those who enjoy their desserts, I would definitely make a stop on Yonge St. and stop by for some Parisian macarons! You won’t be disappointed! In light of the past new rainy and dark days, this morning was actually quite nice! 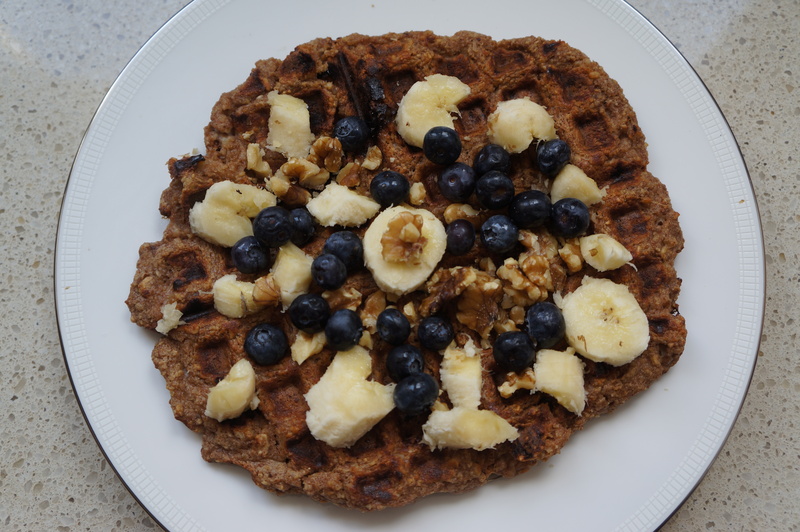 So, in celebration of the sun coming out, I decided to make gluten free and vegan banana walnut waffles– YUM! These waffles were delicious! Every bite into them had crunch from the walnuts as well as sweet flavour from the bananas. The best part about these waffles was that there was NO sugar added whatsoever. Place the walnuts in a high powered blender, such as a Vitamix or Blendtec (or even a food processor) and pulse the walnuts until they resemble a flour-like texture. 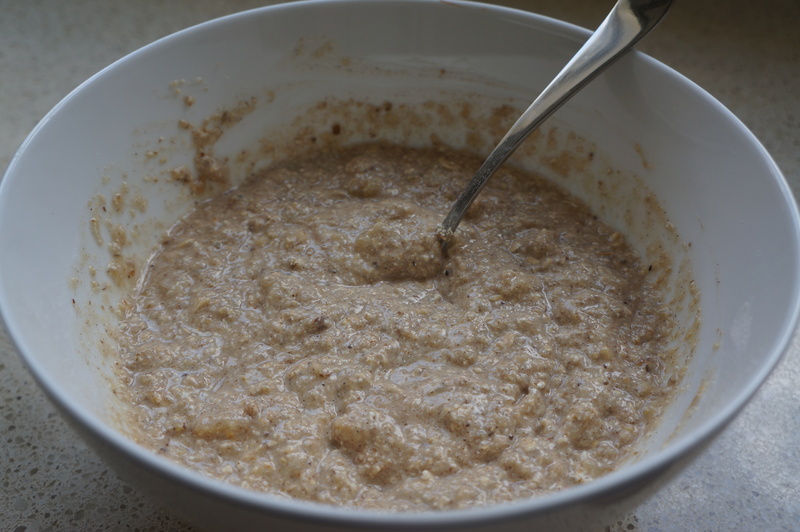 Remove the walnut flour from the blender, and add in the oats and pulse them until they become a flour. Add both flours together as well as 1 tsp of cinnamon. 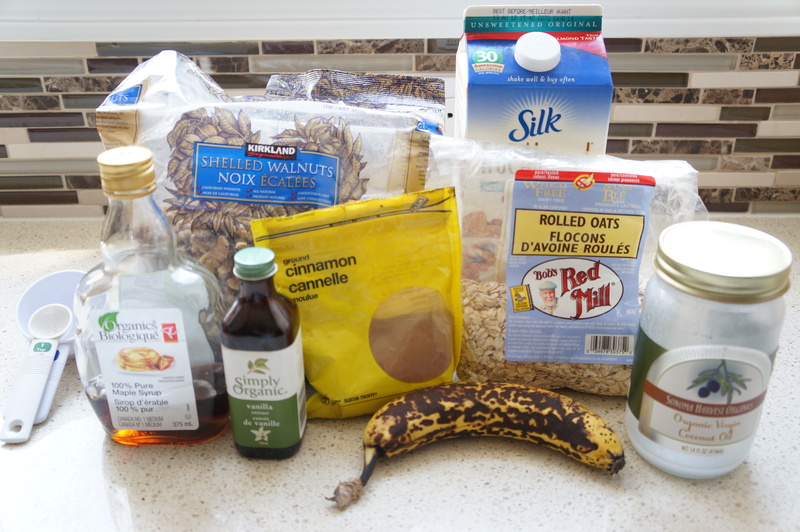 In another bowl, mash the banana, and add in the liquid ingredients and mix them. Add the wet ingredients into the dry ingredients, and mix until well combined. Heat a little oil onto a skillet or waffle iron, and add in the waffle/pancake batter. If making pancakes, check to see if the bottom has browned, once it has, then it can be flipped. 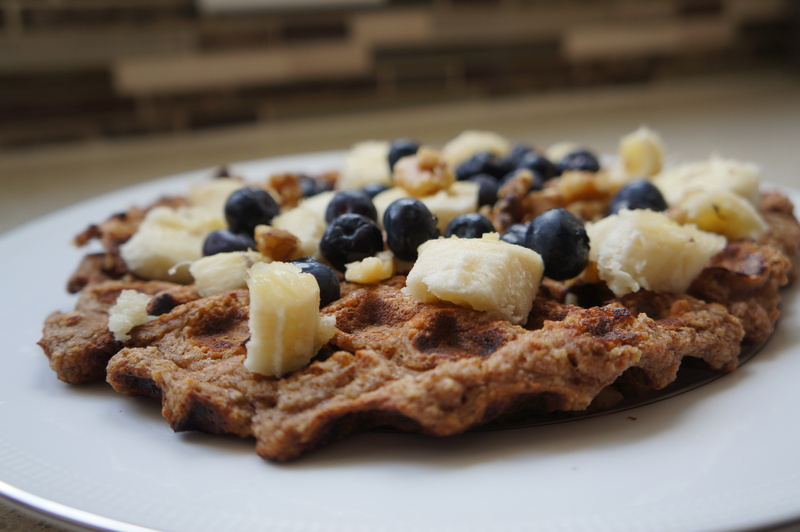 If making waffles, sit back and relax until the waffle iron is done cooking. I let my waffles sit in the iron for a bit longer because I was afraid of the batter sticking to the iron. 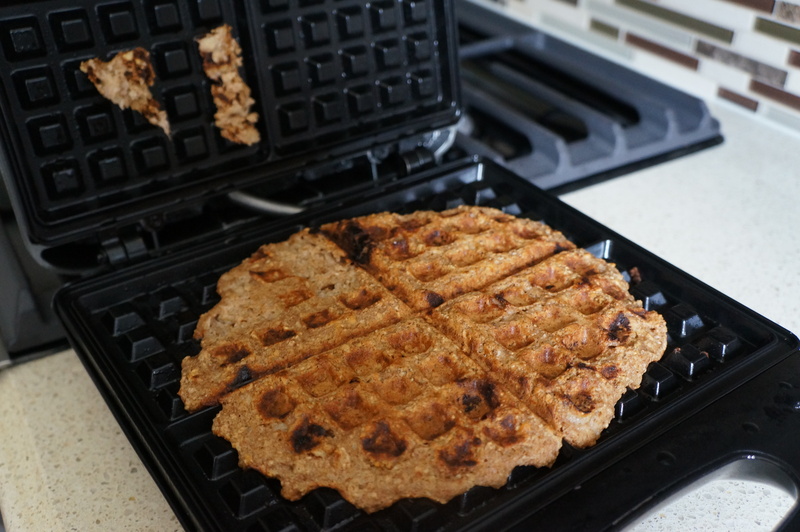 So, if you are planning on using a waffle iron, leave it longer, for the waffle to fully cook. Once the cooking is completed, feel free to add some toppings to it! One of my new years resolutions was to take up some sort of new exercise. I’m not the most active teenage person, but I want to change that. So, I decided to take up hot yoga: Moksha to be exact. Yesterday was my first class and boy was it rewarding. The day before yesterday, I was busy googling people’s experiences with hot yoga/moksha and I was horrified. I read about many people feeling nauseous, dizzy, and even sick. Upon reading those posts, I was scared for my experience. However, there was nothing to be scared or worried about! The staff at Moksha were extremely friendly. They offered me some great tips such as placing my mat near the back of the classroom, where it was less hot, as well as letting me know that it was okay if I wanted to take a break in the middle of the class and go into child’s pose. When I first walked into the classroom, I was blown with a hot breeze of air. I quietly found a place near the back of the room and rolled out my mat and placed my towel over top. I left my water bottle and small face town near my mat as I laid down on my back into Savasana. Savasana was a great way to start off the class because it allowed to body to adjust to the temperature. My mind stopped racing about all the things I had to do later on in the week as I tried to focus on my breathing. After laying in Savasana, the instructor came into the room and spoke to the class in a soft tone. We rested in Savasana for a little bit, as we got to concentrate on our breathing a bit more and then we stood up and moved into the standing series. Although some of the poses were a bit hard for me, I liked how the instructor offered modified positions for the students in the class who couldn’t. My favourite of the standing series was Eagle pose. After a short while, I could feel the sweat dripping down of my face, as well as places I didn’t even know could sweat! After the standing series, came the floor series. I wished there were a bit more poses that targeted the abdominal muscles, but I was pleased with the body-toning poses. The class ended with Savasana. Although it was quite warm in the room, not once did I feel nauseous, dizzy, or sick. I’m very glad that I stuck through the whole class and can’t wait to go back to another class. I also hope that I can try pilates since I would really like to strengthen my body. Have any of you tried pilates or hot yoga? At 6:00am yesterday morning, I was already up and eating breakfast. Why? you may ask. Well, I was getting ready to head over to Brickworks Farmers Market to volunteer! My day at Brickworks started from 7:00am and ended at 2:00pm– and boy was it a LONG and HOT day. However, I had tons of fun at Evergreen as I got to learn a bit more about the area, as well as help out some of the staff in leading activities. After the day ended, I was almost ready to hot into a tub filled with ice. However, I had a better idea… GELATO. Just up the road on Bayview Avenue was Hollywood Gelato, one of Toronto’s many Gelato shops. I had never been to Hollywood Gelato, so I was extremely excited to try out some of their flavours. I ended up getting a small cup with pistachio and pear, while my mom got pistachio and hazelnut. Ever since going to Paris and trying the gelato at Amorino, my mom and I have been extremely judgemental about other gelato shops because Amorino is THE BEST place for creamy, rich, and flavourful gelato. My mom wasn’t too crazy about the flavours she ordered as she didn’t think the flavours were truly pronounced. On the other hand, I thought that the pear flavour was something quite unique. The pistachio flavour however, was nothing too special. I was expecting a nuttier flavour, since the pistachio flavour from Amorino had little chucks of pistachio in every bite, but instead got a sweeter taste. This isn’t to say that Hollywood Gelato is not a good shop, but I prefer gelato to be rich in flavour rather than sugary sweet. Since I had spent the majority of my day in the blazing heat, I decided I should go to another gelato shop– I mean, who can say no to having gelato twice a day. My mom and I headed over to Il Gelatiere. I actually think that Il Gelatiere is one of the best gelato shops I’ve been to in Toronto. 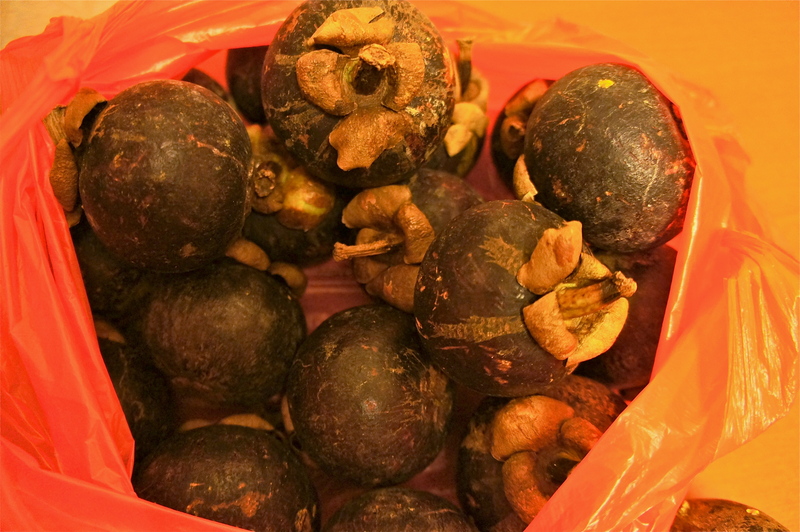 Although it is a bit pricer that Hollywood, their flavours are richer and less sweet. 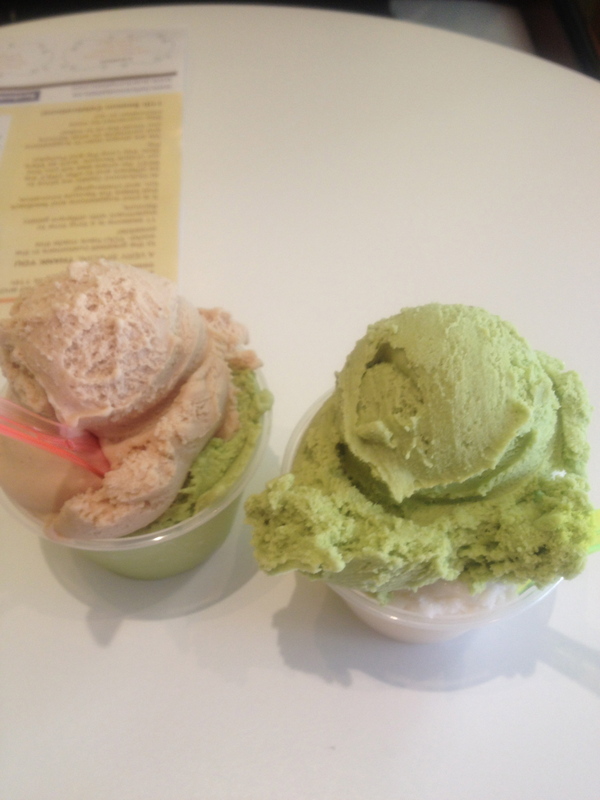 I ordered pistachio and hazelnut (you can probably tell that I LOVE pistachio), and I loved its creamy texture. I found the the pistachio taste was much more evident than Hollywood Gelato’s. My only complain would be the portions. I hoped for a greater serving size for the price I paid because the bottom of my cup was hallow. The server who served me placed the gelato on the side of the cup rather than placing it at the bottom, which lead to a gelato-less bottom. Overall, having a total of four scoops of gelato was a fantastic end to my day 🙂 I’m glad that there are so many more hot summery days left for me to enjoy some gelato! What are some of your favourite gelato flavours? What was the strangest flavour you saw at a gelato or ice cream shop? For lunch today, I went to Tako Sushi, one of the best places to get a cheap and delicious meal. Tako Sushi has many different options for lunch (and dinner) that range from a bento box, to tempura, or even a sushi tray! I ordered one of the sushi combos that allowed you to choose from two different hand rolls. I wasn’t feeling too adventurous today, and stuck with only the avocado and cucumber roll. However, my mom ordered the curry with shrimp that came with 3 cucumber and 3 california pieces. Both of our meals came with a bowl of miso soup, a small garden salad with the house japanese dressing, and ice cream for dessert. 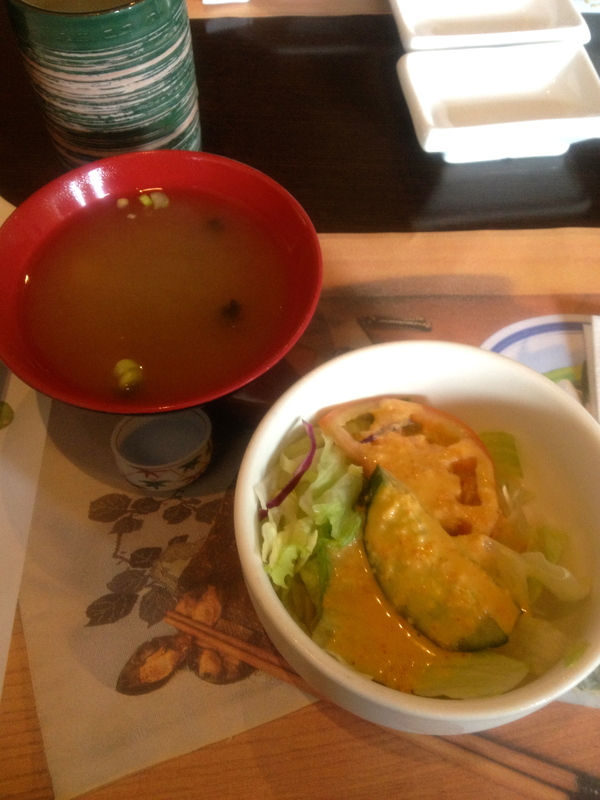 The miso soup was nice and warm, and the japanese dressing was very nice. 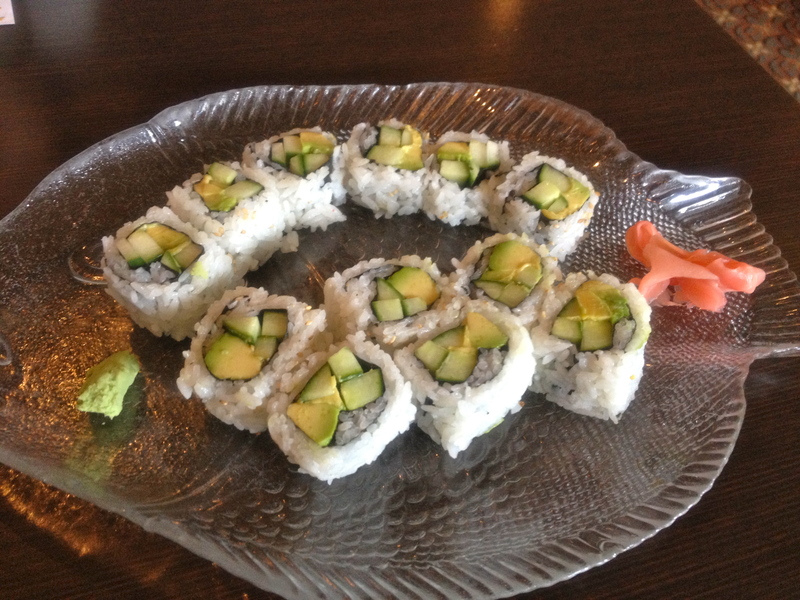 I am a HUGE fan of sushi, and I thought that the avocado and cucumber roll was dynamite! The vinegar in the rice was not over powering, and the creamy texture of the avocado with the crunchiness of the cucumber was just what I needed. All 12 pieces down my belly! My mom said that her curry dish was good, but a bit salty. However, she seemed to enjoy the crispiness of the shrimp. There were four pieces of battered shrimp, but my mom ate one before I could grab a picture! 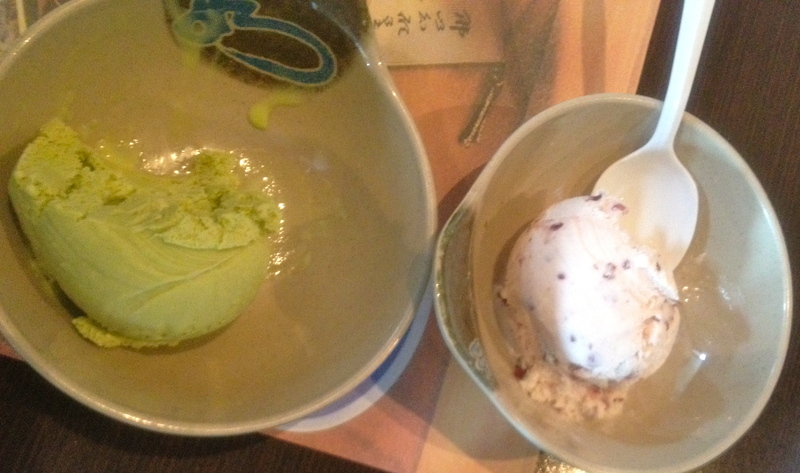 After, we got to choose from three different ice cream flavours: mango, green tea, and red bean. I ordered the green tea and my mom ordered the red bean. I personally loved the creaminess of the green tea, and the sweetness was just right. My mom doesn’t have too much a sweet tooth, and thought that the ice cream was a bit too sweet. I could resist and had to try a bit. I thought it tasted fine, but compared with the green tea, I preferred the green tea flavour. Overall, Tako Sushi offers a great variety of Japanese cuisine at a great price! 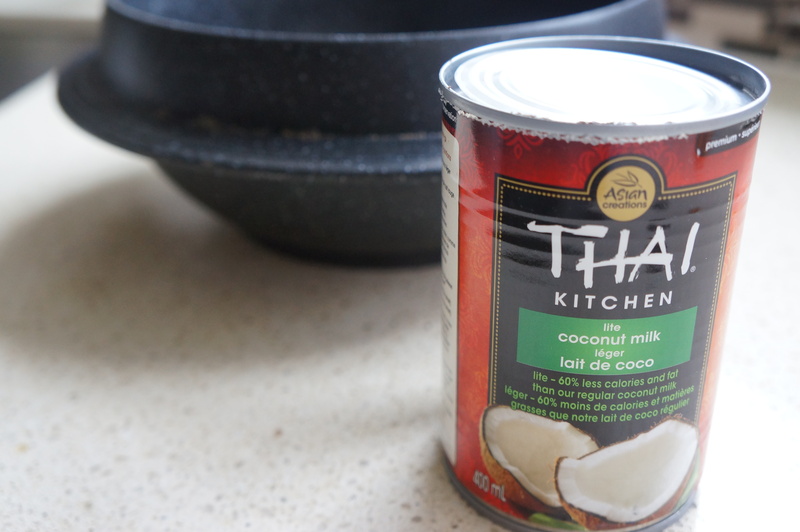 Now that school is over, I have oodles of time to do what I love– EAT and COOK! 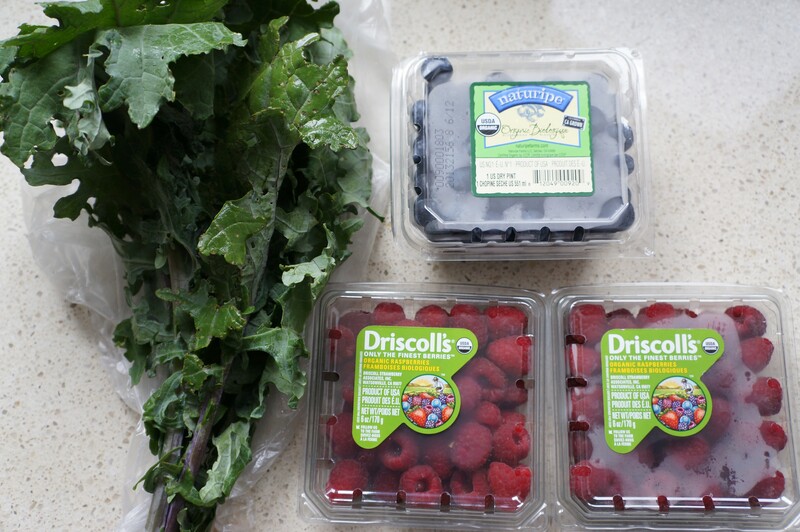 To start my morning, I made a large Greens smoothie that contained blueberries, raspberries, kale, chia seeds, and bioflavia. 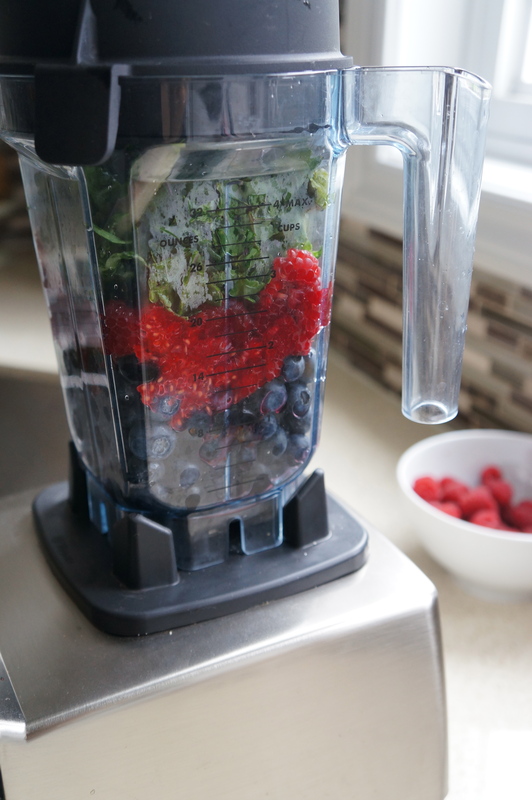 There wasn’t enough room in the blender for all of those berries and kale, so unfortunately, the raspberries were the ones that had to get squished! Later on in the day, I was around the Highway 7 area, and decided to stop by at one of my favourite vegetarian restaurants in Toronto, Gourmet Vegetarian Restaurant. They serve some of the BEST vegetarian food in Toronto in my opinion. What I like about Gourmet Vegetarian is that compared to other Asian vegetarian or non-vegetarian restaurants, they do not use too much oil or salt, and can make the dishes without adding MSG, which is a major chemical additive in many of our foods today. Some of the dishes ordered were the veggie steak with black pepper sauce on hot plate, veggie curried fish, cha shiu bao (which is a traditional chinese dim sum order that contains barbecued pork in buns), and veggie meatballs. 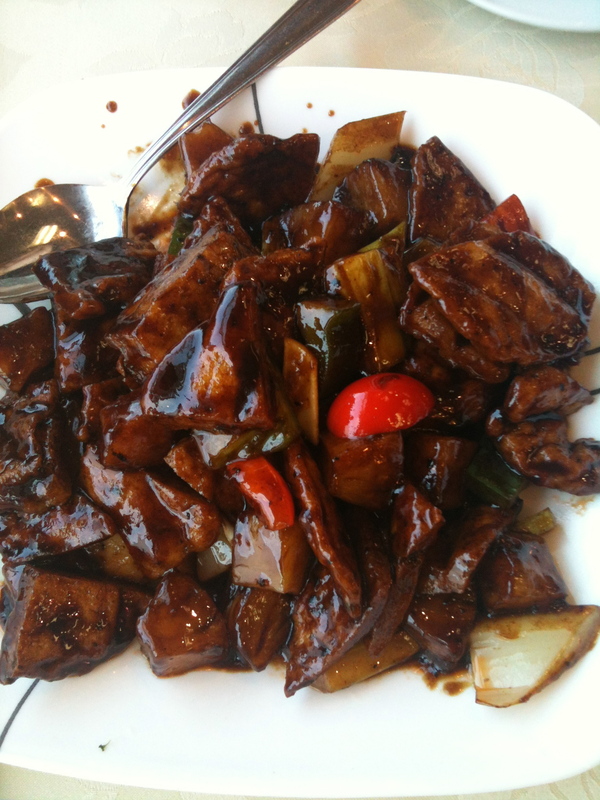 The veggie steak with black pepper sauce is one of the best dishes made at Gourmet Vegetarian– I order it EVERY time I go there. 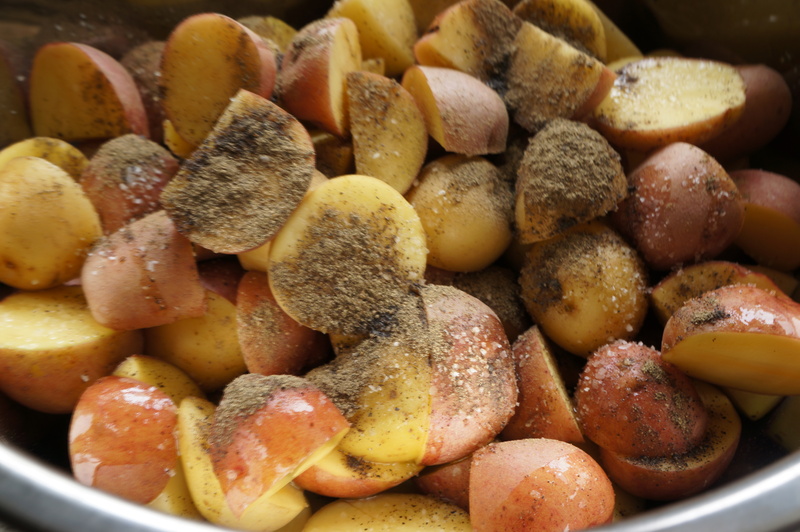 The black pepper sauce is extremely rich in peppery flavour. 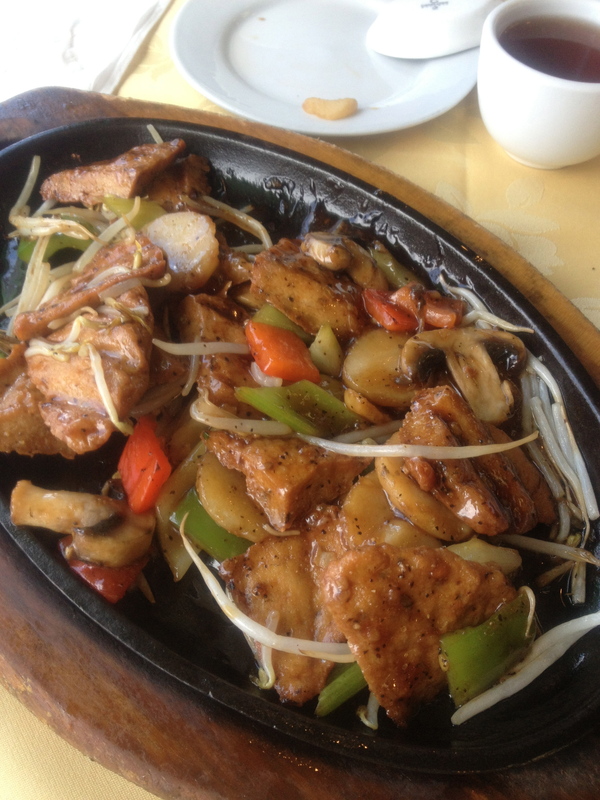 The veggie steak, which resembles thin slices of beef , is perfectly seasoned and tastes amazing with the sauce. 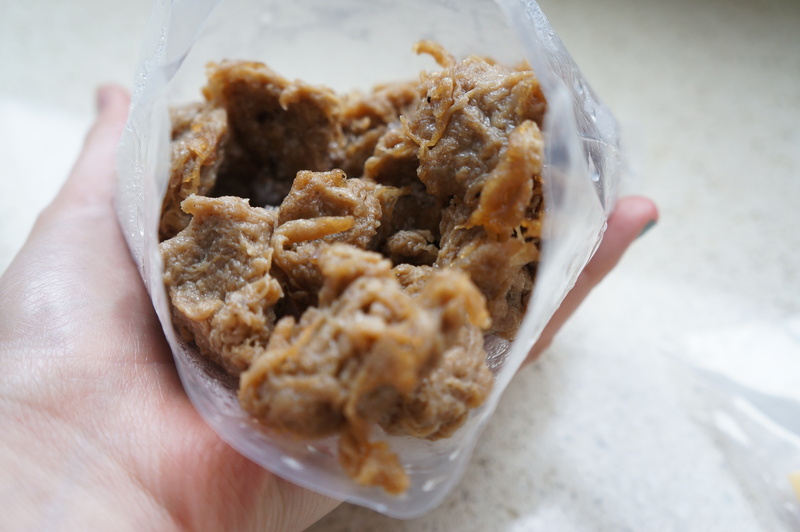 Not everyone has tried mock meat/ seitan before, and if you are wondering, it is fairly chewy and tastes very good with seasoning and flavouring. 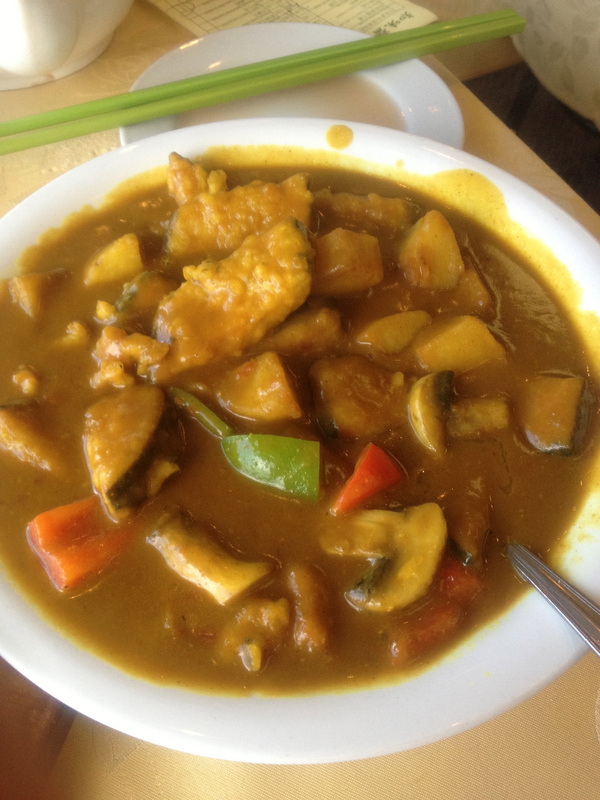 The veggie curried fish was a new dish that my mom and I ordered and it was up to par with the other foods we’ve tried. The curry sauce was not too spicy, which was perfect for my mom since she doesn’t do overly spicy foods, and having the veggie fish in the sauce was a great addition of flavour. 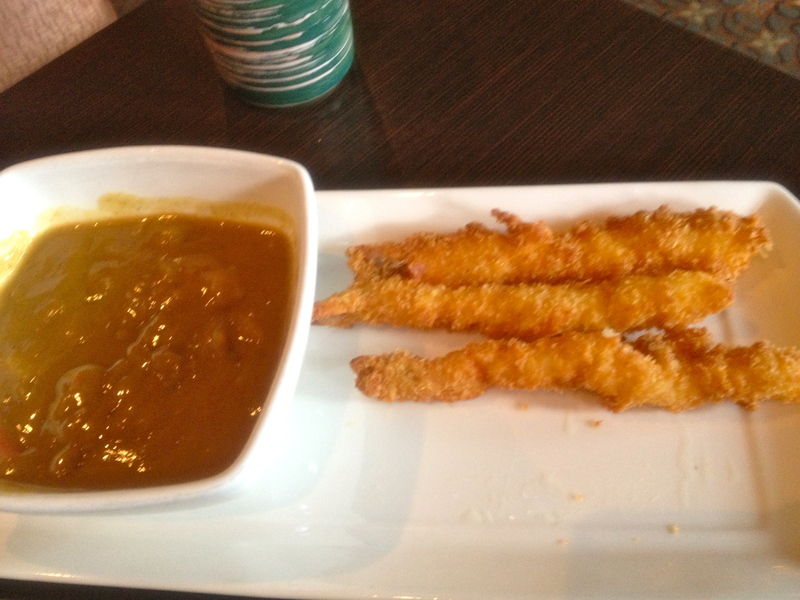 The veggie fish itself is lightly covered in a tempura-like batter, and the taste of the “fish” adds some saltiness to the curry. One of my favourite parts of this dish, is that it wasn’t greasy. Usually, when my mom and I go for curry, the sauce is just so rich with the butter and oil, that we are left feeling sick. However, this curried dish was just right. 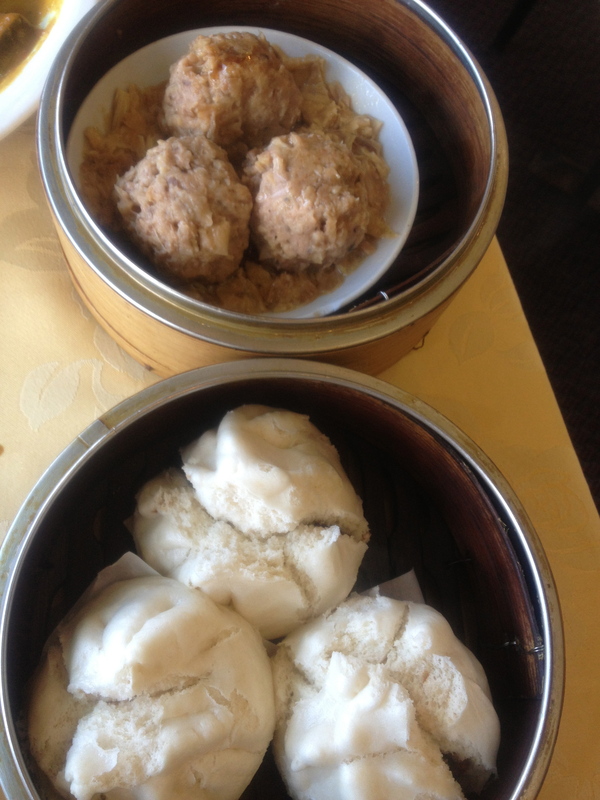 The dim sum that we ordered were also just as appetizing. The veggie meat balls had tons of juicy flavour to it, and the cha shiu bao had a great fluffy bao, and a sweet mixture of the barbecued “pork” inside of it. After sampling a bit of everything, My mom and I left the restaurant feeling stuffed. There was no way we could have finished all of the food, so we took some of it to go– leftovers for tomorrow 🙂 I urge any one, vegetarian or non vegetarian, to head over to Gourmet Vegetarian to try some of their DELICIOUS asian dishes. 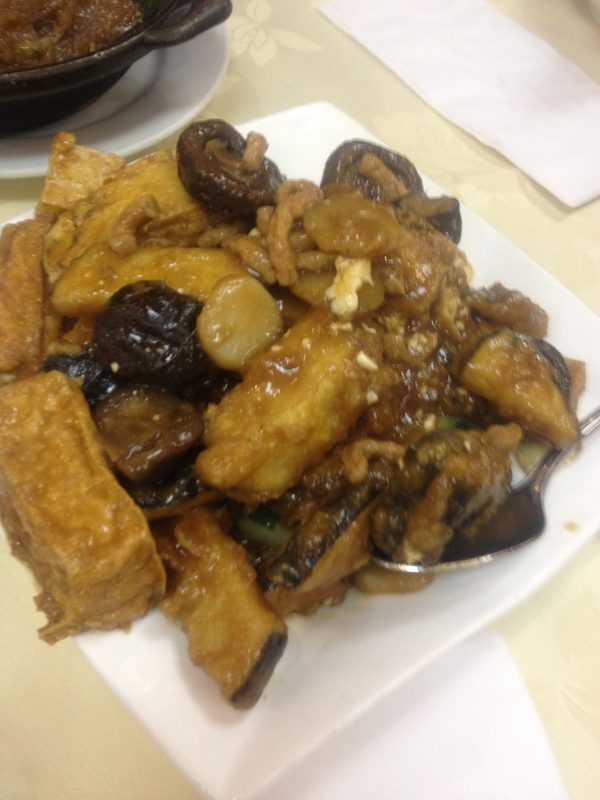 Some of their other noted dishes include deep fried veggie fish, taro & veggie chicken with coconut milk, and chinese style veggie steak with BBQ sauce. … and voila! 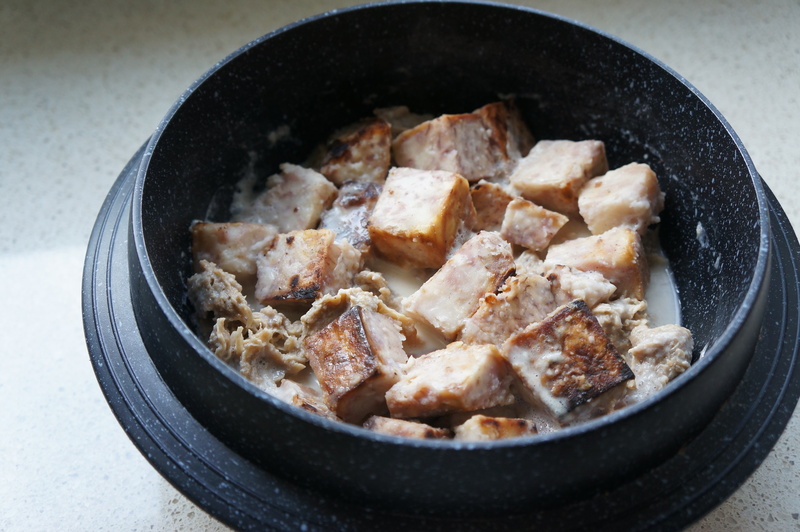 Taro and Chick’n Coconut Milk Pot! I am so glad how the hot pot turned out– and the best part is that it wasn’t hard to make at all! The taro was extremely soft and the coconut milk tied the whole dish together. Overall, it was a fantastic meal, and I will definitely be making this again! 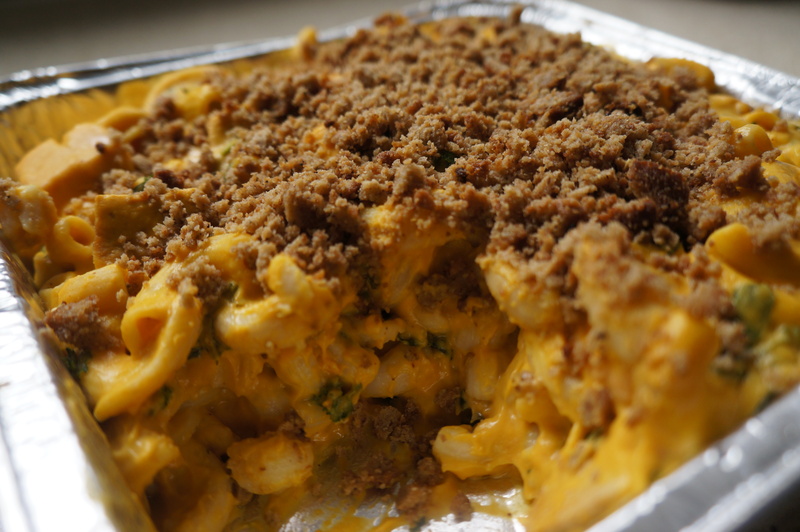 *Also, if you have a TVA card, you get 10% off your meal at Gourmet Vegetarian! Today was an extremely relaxing day. 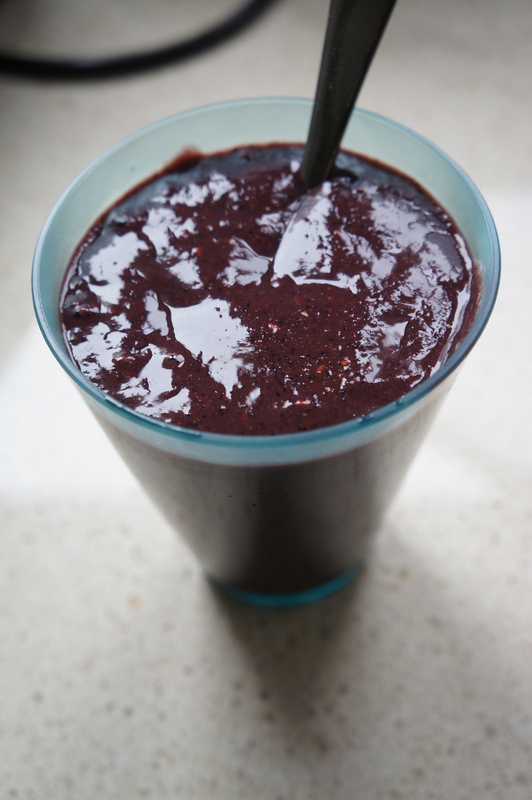 It started off with a Greens smoothie, followed by Wimbledon, and then cooking! I have to say that the highlight of my day was the game between Lisicki and Williams. Although I was disappointed with Serena Williams’ loss, Sabine Lisicki played extremely well . Now I can’t wait for the quarterfinals as I am sure it will be an intense match between all of the players. 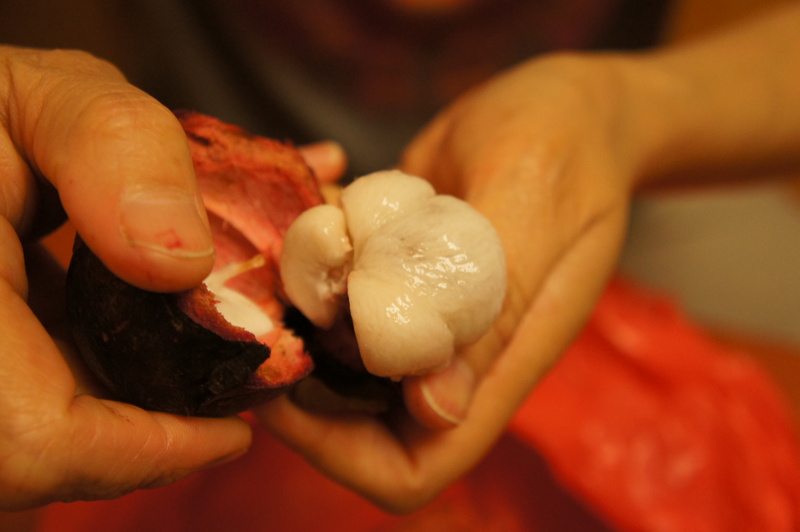 Half way into the game, I went upstairs to grab a snack, which turned out to be mangosteen, “Queen of the Fruits.” For those of you who haven’t heard of this delicious and tropical fruit rich in antioxidants, let me tell you, it is delicious! 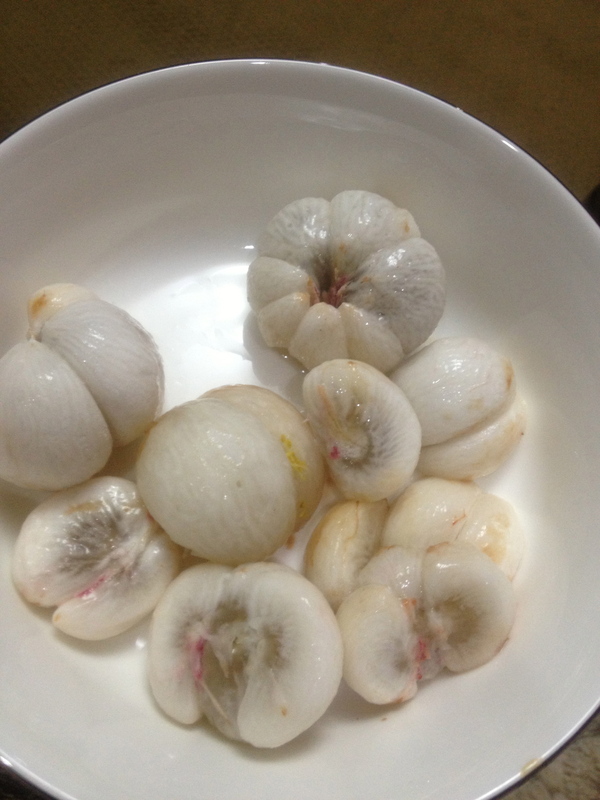 It is extremely succulent and sweet– almost like a lychee. I may have not taken the best photos, as they do not look very appetizing, but I’ve come to terms that not all tasty food has to look good! Later on in the day, it was time to prepare (or reheat) my lunch! 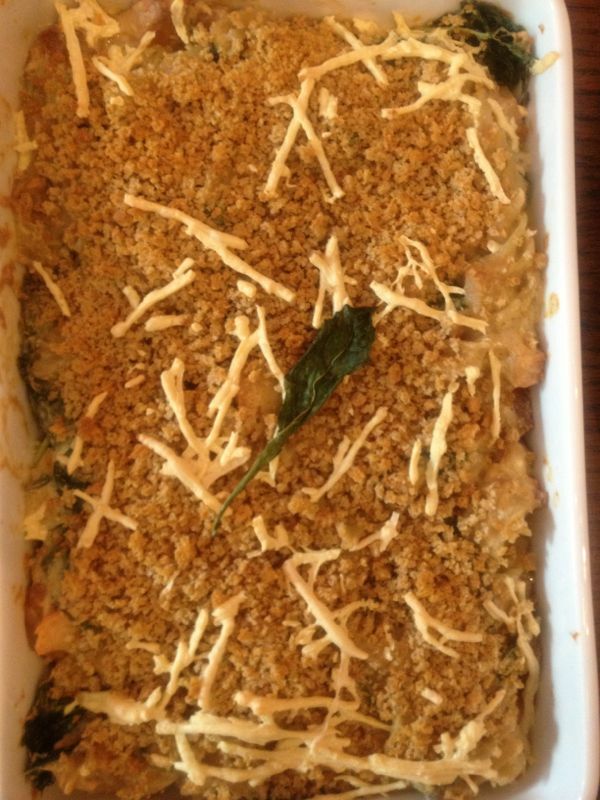 On Saturday, June 29th, my mom and I went over to Brickworks Farmers Market and bought a tray of Chef Doug McNish‘s Vegan and Gluten Free Cheesy Squash Baked Mac N Cheese with Smoked Tofu and Kale. 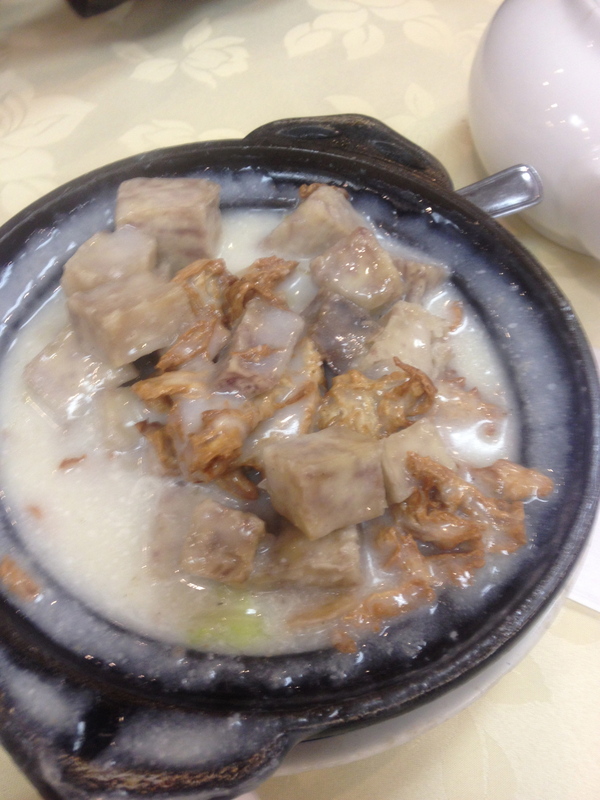 It is one of my most favourite dishes. 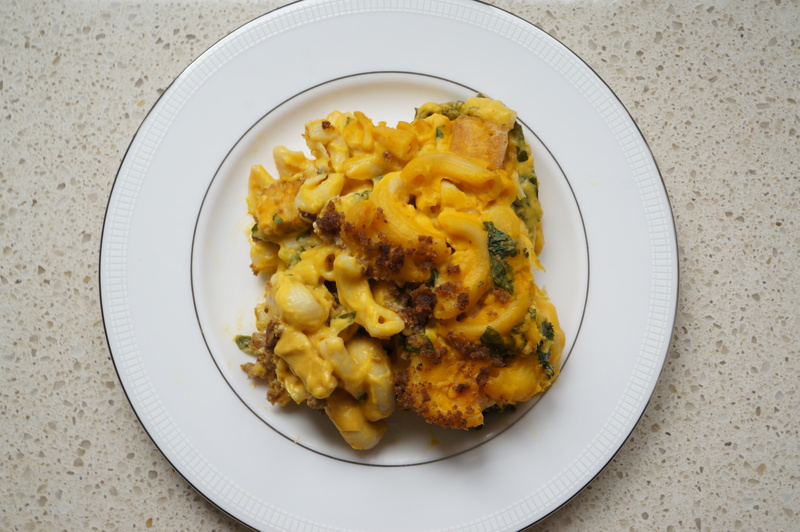 The creamy “cheese” sauce made with butternut squash is very flavourful and not overly salty, like many other vegan mac n’ cheese dishes. 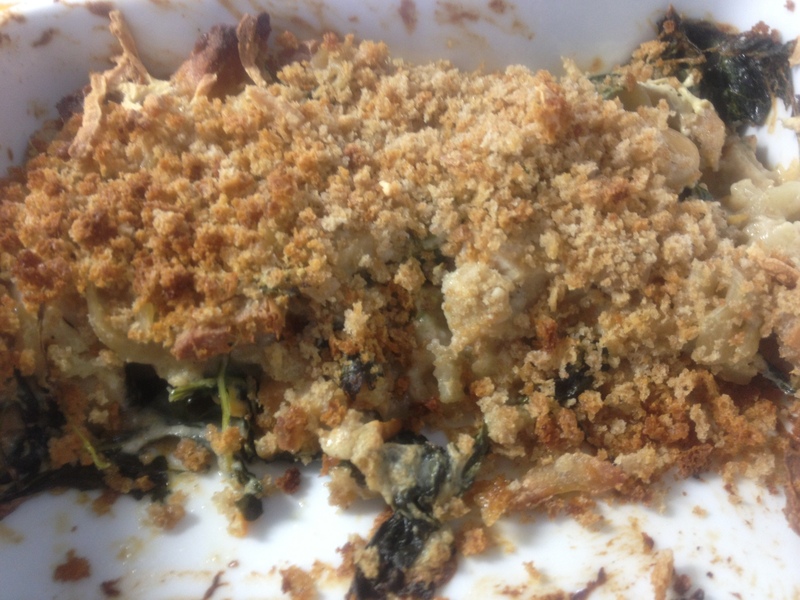 In order to bring more texture to the dish, there is a gluten free breadcrumb crust, which is my favourite part because it adds some crunch to the mac n’ cheese. The bits of kale and tofu are also a great addition of some veggies and protein, and work extremely well in the pasta dish. 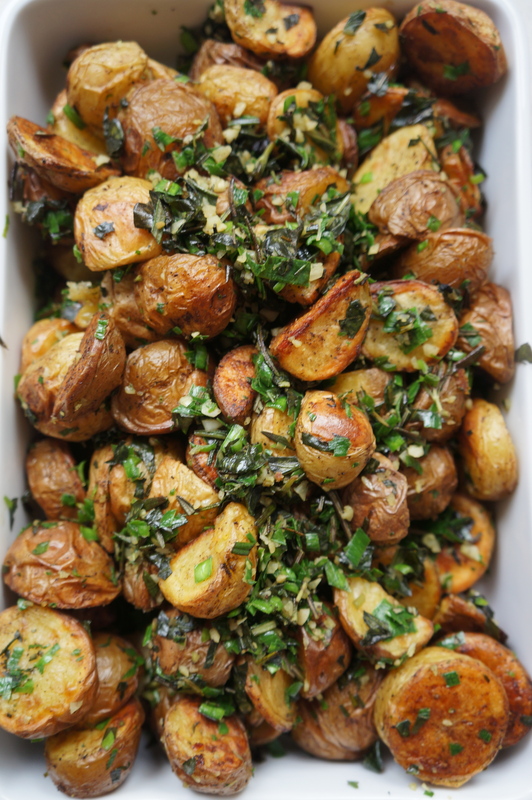 For dinner, I prepared some tasty roasted potatoes with EVOO, chive, basil, rosemary, garlic, pepper, and salt– boy did they taste good! They were perfectly seasoned and not too salty. Well, that’s all for today, got to get working on my assignment for school! Have a wonderful night!